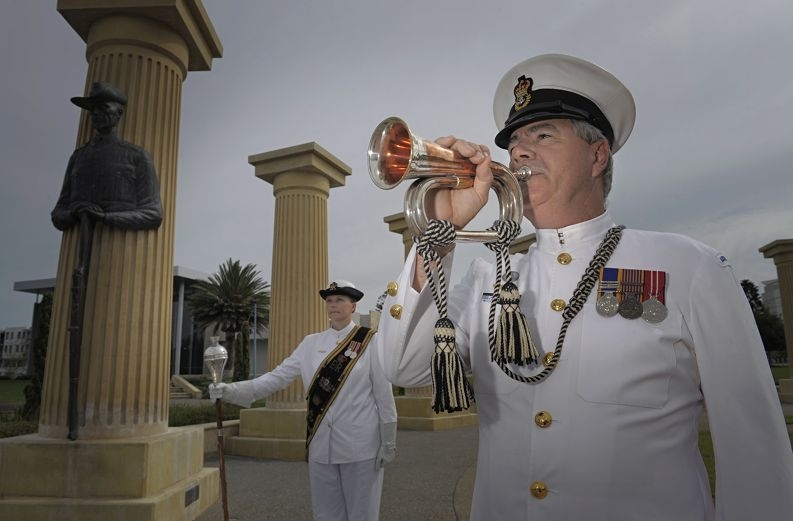 The Chief Petty Officer Musician with the WA Detachment of the Royal Australian Navy Band has played the Last Post and Reveille at Rockingham’s Anzac Day dawn and 11am services for at least 10, maybe even 15 years ” since before Flinders Hall was demolished, and the war memorial expanded and moved to its current adjacent location. He was there yesterday while hundreds of listeners’ spines tingled as they paid their respects to the men and women who made the ultimate sacrifice in defence of our freedom. But, as always, his knees shook with nerves despite hours of practice to get the tribute just right. ‘It’s a good thing I wear long trousers otherwise you’d have seen my knees shaking,’ he said. ‘The Last Post is hard work. He said a bugle was 1.5m of curved brass tubing ending in a funnel that worked in a similar way to the didgeridoo. ‘And it’s harder to play if the weather is cold,’ he said. ‘It means warming up your lips to make sure there’s some flexibility. ‘It’s a great feeling when I get it right because it’s not an easy piece of music to play and it means so much to so many. The bugle plays six notes over two octaves, and the pitch is determined by the tightness of the mouth and facial muscles, or embouchure, as the player blows into the mouthpiece. Anzac Day is a busy one for CPO Tait and the navy band, with performances at the popular Rockingham dawn service before travelling to Perth City for the 9.30am march and back to Rockingham for the 10.45am march and main service, which is the metro area’s largest after Perth. The band was awarded a Group Commendation from HMAS Stirling Commanding Officer Captain Brett Wolski for its exemplary performance ” including CPO Tait’s Last Post and Reveille renditions ” prior to the Len Hall Commemorative AFL match between the Fremantle Dockers and Western Bulldogs on April 25, 2011. CPO Tait, whose day job is station officer at the Osborne Park Fire Station, comes from a musical family and first heard the Last Post performed as a 10-year-old while playing third cornet in the Katanning silver band. He began playing the trombone as an eight-year-old and joined the navy band in 1976.